The bright star is Gamma Cygni. Most of the surrounding red nebulosity is IC 1318, including the Butterfly Nebula to the left. Above Gamma and slightly to the left is the open cluster NGC 6910. The cluster above and to the right of Gamma is Cr 419. The cluster in the upper right corner is IC 1311. 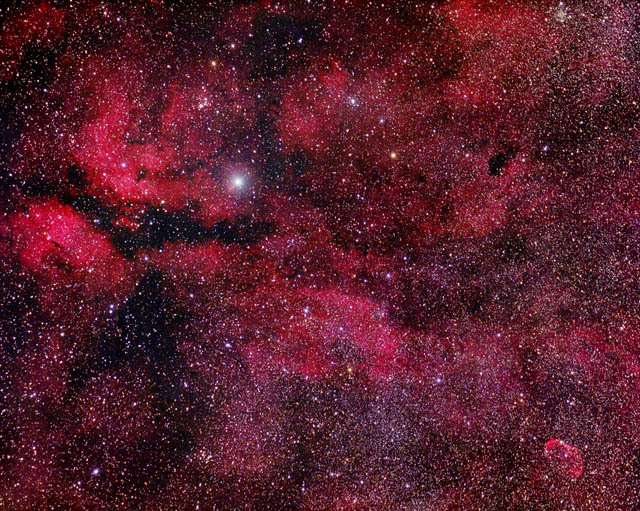 The dark nebula way to the right of Gamma is Barnard 343. At bottom right is the Crescent Nebula (NGC 6888). The cluster way under Gamma is M29. The galactic equator passes through the lower left corner. There are many other catalogued objects in this field of view.